A vintage novelty music box with stand. This box has a see through plastic banjo that plays, "Close to You." New in box, old stock, good value ( an 18 note mechanism sells for 15.95), as supply lasts. This is a cute economical addition to a music box collection or just a cute gift to the fretted instrument player in your life. Measures approximately 3 1/2" x 8" tall. 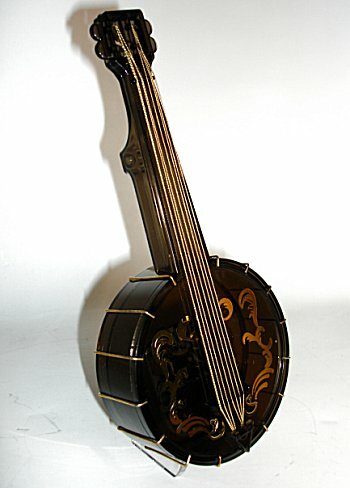 Not sure why it has 8 thin gold rope-like strings, perhaps a mandolin banjo? You can actually remove the double strings to make it look like a (4 string) tenor banjo, or remove just a couple of strings and call it a banjo guitar.